Black Dog & Leventhal, 9780762466689, 256pp. Embrace the not-so-small world of minis--and your own tiny book! Kate Ünver, a lifelong collector of nearly 1,000 items, has curated unique and extraordinary miniatures on her Instagram account, @dailymini, since 2012. In The Book of Mini, she selects hundreds of pieces of artwork--many of which have never been seen before--and organizes them into sections on tiny food, diminutive wildlife, petite pottery, and more. Also included are interviews with collectors and artists exploring their methods, influences, and how they came to adore everything mini. Kate Esme Ünver is a social media and communications professional who's passionate about storytelling, art, and design. 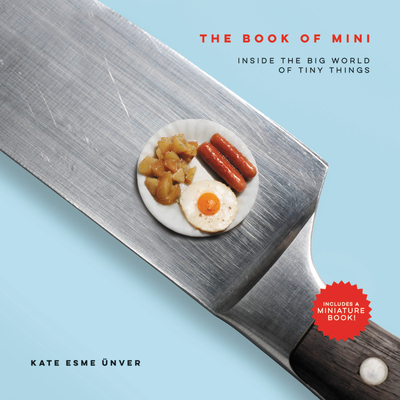 In 2012, Kate launched @dailymini, a digitally curated space that promotes miniatures and small-scale news through interviews and studio visits with internationally renowned artists and designers. She currently serves on the Board of Trustees of the International Guild of Miniature Artisans and provides social media consultancy services to miniature makers around the world. An avid tennis player, she's also a well-traveled motorcyclist and life-long collector of miniatures. She lives in New York, NY.